The world's first translucent superline for near invisibility underwater Advanced technology FireLine is now 20 percent stronger than before. Size > FLFS6-CY 125yd Crystal 6/2 Lb. Test/Line Diam. Size > FLFS20-CY 125yd Crystal 20/8 Lb. Test/Line Diam. Size > FLFS10-CY 125yd Crystal 10/4 Lb. Test/Line Diam. Size > FLFS8-CY 125yd Crystal 8/3 Lb. Test/Line Diam. 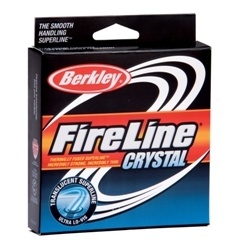 Size > FLFS14-CY 125yd Crystal 14/6 Lb. Test/Line Diam..